The base class for the text sequencers. This class treats the text to be sequenced as a series of rows, with each row delimited by a line terminator. Concrete subclasses provide their own mechanisms for splitting a row of data into a series of columns. 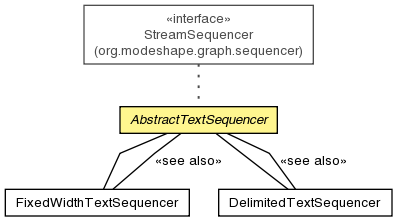 This class provides some fundamental capabilities, including the ability to set a comment marker, limit the number of lines to be read from a file, and provide custom transformations from the sets of columns to the graph structure. Creates an instance of the row factory configured for this sequencer. Sets the comment marker to use. Sets the maximum number of lines to read. Sets the custom row factory class name. Sets the comment marker to use. Any line that begins with the comment marker will be ignored and will not be counted as a read line for the purposes of the maximum line limitation. Sets the maximum number of lines to read. When this number is reached during the sequencing of any particular stream, the stream will be closed and remaining lines (if any) will be ignored. Comment lines do not count towards the number of lines read. maximumLinesToRead - the maximum number of lines to read; a non-positive number indicates that all lines should be read and sequenced. Sets the custom row factory class name. This method attempts to instantiate an instance of the custom RowFactory class prior to modifying the row factory class name to ensure that the new value represents a valid implementation. rowFactoryClassName - the fully-qualified class name of the new custom row factory implementation; null indicates that the default row factory should be used. IllegalAccessException - if the row factory class or its nullary constructor is not accessible. InstantiationException - if the row factory represents an abstract class, an interface, an array class, a primitive type, or void; or if the class has no nullary constructor; or if the instantiation fails for some other reason. className - the name of the class to configure; null indicates that the default row factory should be used.